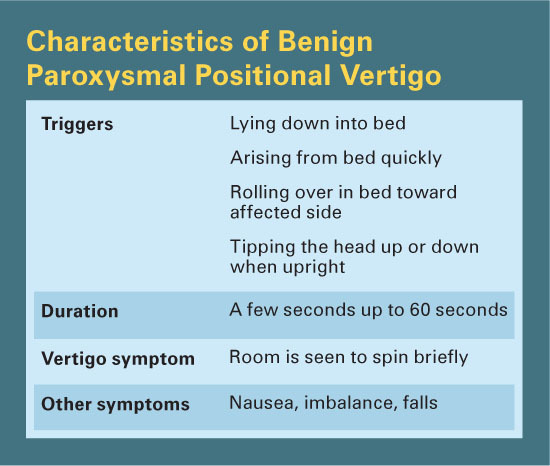 Benign paroxysmal positional vertigo (BPPV) is the most common cause of vertigo, in which the environment is seen to spin. 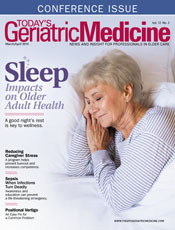 Rarely seen in people younger than 30, it steadily becomes more prevalent with age, affecting about 10% of geriatric adults.1 BPPV accounts for almost one-half of all dizziness in patients older than 65.2 Because fall risk also increases at older ages, BPPV can greatly magnify the risk of injury. About 60% of BPPV cases occur in women and 40% in men. First, the vertigo is triggered by head movements: lying down, sitting up from reclining, rolling over in bed, tipping the head up, or bending over and then lifting the head. This means the vertigo is likely to happen for the first time in bed, most often when rolling over during the night or when attempting to arise from bed in the morning. The vertigo is intense but brief; the environment is seen to spin for as little as a few seconds and not more than a minute. Repeating the head movement that triggered the first spell will set off another spell. In between the bouts of vertigo, patients can sometimes feel slightly off balance when up and walking. BPPV is unique among diseases because it’s a purely mechanical disorder and can be treated easily with head maneuvers. It occurs when heavy particles in the inner ear become dislodged from their sensor and enter the spinning sensors by accident. The inner ear is filled with a fluid, endolymph, which acts as a conduit that can carry particles to other parts of the ear. The problem begins with the utricle, which is a gravity sensor in the inner ear (see Figure 1). A layer of relatively heavy calcium carbonate crystals, the otoconia, allow the ear to sense the direction of gravity or tilt of the head by pressing down and exerting sheer force on the hair cells of the utricle. The shifting of otoconia on the utricle also provides a sensation of linear acceleration. The otoconia are held on the sensor by a sticky matrix, but can break off and become mobile due to age or after minor trauma, such as bumping the head. Since the inner ear is filled with fluid, loose particles tend to sink and settle in the lowest parts of the inner ear. In the upright position, the lowest part is in the posterior semicircular canal, making this the canal that’s most affected by BPPV. 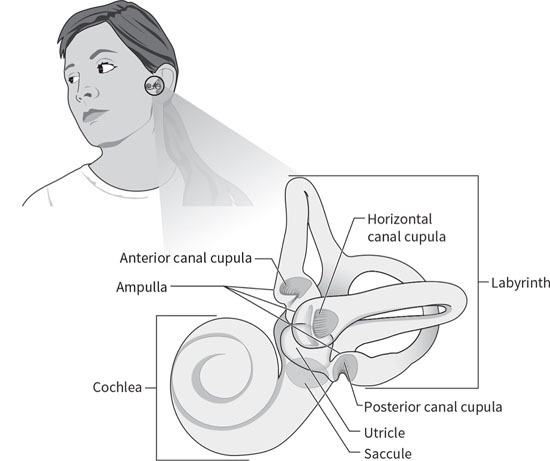 The openings leading into the semicircular canals, the three spinning sensors of the ear, are located directly above the utricle. Once otoconia have become dislodged, it’s possible that BPPV will develop if those particles enter the semicircular canals. This can’t happen easily when individuals are upright. However, when they’re lying flat on their backs, the openings are below the utricle, and heavy otoconia can easily fall in. A few crystals in the canals do not cause symptoms, but once a large mass forms, vertigo will begin. These masses of particles act like a piston in the narrow canal, moving the fluid briskly. This then moves the spinning sensor, a diaphragmlike flange called the cupula, and that movement is transmitted to the brain as a brisk spin. The inner ear controls eye-movement responses to motion, so the sensation of rotating is accompanied by the rhythmic rotational eye movements of nystagmus. This causes the patient to see the environment as spinning violently during the attack. Loose otoconia usually end up in the posterior canal, which is oriented vertically in the head and normally senses nodding head rotations. When individuals are flat on their backs, this canal is oriented with its opening facing up, just under the location of the utricle with its otoconia, so it’s particularly vulnerable to BPPV. Otoconia can easily fall into the opening and begin to move deeper into the canal. Once the particles have passed around the canal to the halfway point, if the patient then sits up, the particles will be drawn by gravity to the lowest part of the canal, farthest from the opening and adjacent to the cupula. The otoconia are too heavy to move back up through the canal and escape but will slosh back and forth in the fluid as the head tips, setting off vertigo spells each time. Untreated BPPV tends to gradually resolve. Moving the head when lying down moves the otoconia; with time, they can exit one by one on their own, but this can take weeks or months. The key to quick recovery is to place the head upside down, allowing the particles to drift back toward the opening where they can be expelled by raising the head in a certain way. The typical history of brief vertigo brought on by moving quickly makes the diagnosis likely (see table). The clinician should attempt to guess which posterior canal is affected because this can help decide which ear to test first. The best clue is that the dizziness is worst when the patient rolls toward the affected side. For example, if the patient reports an attack when rolling out of the bed to the left, the left ear is the more likely source. If a side of involvement can be identified, it’s best to test the normal side first to ensure that it’s clear and follow with the affected side and immediately apply treatment. The test for BPPV is the Dix Hallpike maneuver.4 This involves rotating the patient’s head in the plane of the affected posterior semicircular canal, causing the particles to move. As this happens, the patient will report dizziness and a characteristic nystagmus will appear. The purpose of the Dix Hallpike maneuver is to move the head in the plane of the posterior canal through more than 90 degrees, which will maximize the nystagmus intensity and duration so that it’s easily seen (see Figure 2). Patients should be seated lengthwise on an exam table and positioned so that when they are reclined, their shoulders and neck will reach the end of the table and their heads will drop back in a dependent position off the table. The posterior canal is located at a 45- to 50-degree angle to the sagittal plane, so to maximize particle movement the head should be turned 45 degrees to the side before the maneuver begins. This will place one of the posterior canals in the sagittal plane of the body. To stimulate the right canal, the patient’s head will be turned 45 degrees to the right, and vice versa for the left canal. Begin by standing next to the exam table and holding the patient’s head in both hands. Rotate the patient’s head toward yourself until it reaches a 45-degree angle to the sagittal plane. Then ask the patient to lie down quickly with the eyes open. 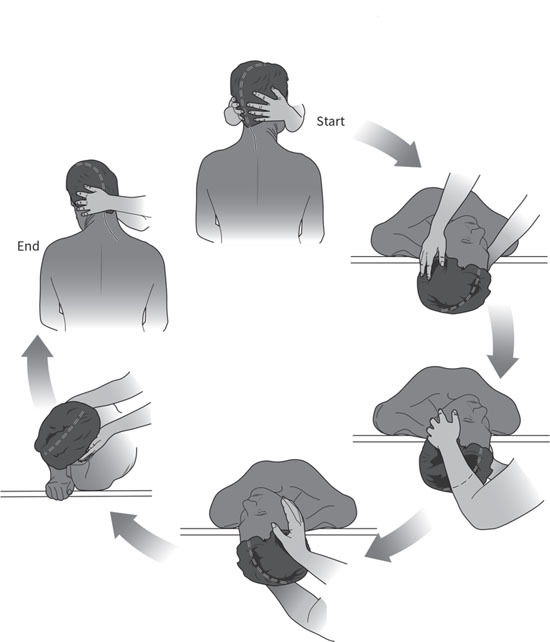 The head should be held firmly so that it stays at 45 degrees to the body as the patient reclines, and the neck should be stabilized so that it is supported as the dependent head position is obtained. When the patient is lying flat, the head should be off the table, the top of the head downward at an angle of 20 to 30 degrees below the horizontal and supported by your hands. In frail patients, it’s permissible to keep the head on the table for support, lifting the chin to help tilt the head back. There is a lag, called latency, before the nystagmus begins. This can be as short as a few seconds or can be delayed by as many as 15 seconds, so continue observing the eye movement for at least 15 seconds before assuming the test is negative. The nystagmus of BPPV is paroxysmal, meaning that it’s small and fine as it begins but rapidly builds to an intense burst of course nystagmus before gradually dying away. The nystagmus of classic posterior canal BPPV is torsional and up-beating in direction. In the Dix Hallpike position with the head dependent, the upper poles of the eyes appear to be beating toward the floor in short arcs. This fades away in under a minute. Nystagmus that shows no latency or that continues steadily beyond one minute is usually not due to BPPV. There are rare forms of BPPV affecting the horizontal canal that can cause nystagmus that beats horizontally (the eyes move from canthus to canthus), and BPPV can also affect the anterior canal, causing nystagmus that can beat vertically or obliquely, but these rare forms are still usually paroxysmal and disappear over roughly a minute. The Dix Hallpike maneuver is advantageous as a test because it causes an intense nystagmus that’s easy for the provider to see without special equipment. It also moves the causative particles in the direction of the exit from the canal. By the end of the maneuver, the particles are about halfway around the canal so they are in a position to be easily removed. BPPV is treated with simple head maneuvers that basically rotate the head in the plane of the affected canal, allowing particles to move out using gravity. These can be applied by the physician or other providers or can be given as home exercises (available online) and can give immediate relief from the vertigo. The maneuver for posterior canal BPPV used by most providers as an office procedure is the Epley maneuver (see Figure 3), which was devised by John Epley, MD, of Portland, Oregon, in 1980.5 It takes advantage of the Dix Hallpike maneuver as the first step, allowing the diagnosis to be made when the characteristic nystagmus appears. Since particles are moved near the canal exit by the Dix Hallpike maneuver, only a few additional movements are needed to remove them completely. An assistant is required, and the maneuver is best performed on an exam table. At the conclusion of the Dix Hallpike maneuver, the patient is lying with their head dependent off the exam table, turned 45 degrees toward the floor. If the nystagmus of BPPV appears, this confirms the diagnosis, and the rest of the Epley maneuver is then immediately applied. If the nystagmus appears when the head is turned toward the right, this indicates that particles are in the right posterior semicircular canal (particles in the left canal causes nystagmus with the head turned left). When treating the right ear, the head is turned to the right for the Dix Hallpike maneuver, with the provider standing on the right side of the exam table and the assistant on the left side. The provider waits until the nystagmus ends and then turns the head toward the left shoulder, stopping with the head turned about 45 degrees toward the left. Another wait of 30 seconds takes place to allow the particles to move as far as possible in the canal, before the patient is rolled onto their left, unaffected side, allowing the head to turn farther toward the left shoulder, until the patient is facing the floor at a 45 degree angle. The particles are allowed to move passively by gravity for another 30 seconds before the patient is made to sit up on the left side of the exam table, facing the assistant. It’s best to repeat the maneuver until all vertigo has ceased. The Epley maneuver can be used as a home exercise, but it has limitations. The Dix Hallpike maximizes nystagmus and vertigo and so can be unpleasant for patients to perform on their own at home. Dangling the head off the bed unsupported during the Dix Hallpike can strain the neck. It’s also hard for patients to understand how to reach the 45-degree angles needed during the maneuver. Beds tend to be wider than exam tables and make it hard to perform the last part of the maneuver when patients are returning to a seated position. Not all patients have assistants to help them perform the steps. To meet the need for a simpler home exercise, the half somersault maneuver (see Figure 4) was devised; the author has been published on this subject.6 It doesn’t require an assistant and can be done on any stable surface, usually the floor or a bed. 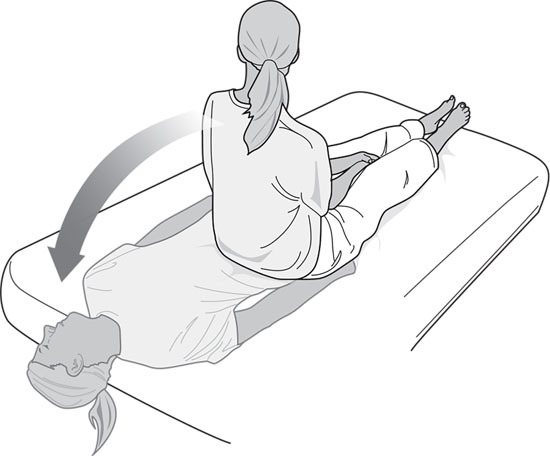 The Dix Hallpike is not used, so the vertigo is not as severe as it can be during the first step of the Epley maneuver. Instructions can be provided to patients by handout, and a tutorial is available online at www.youtube.com/watch?v=1VWyPgfMuvM. The Dix Hallpike maneuver should be performed on any patient presenting with vertigo unless there’s a spontaneous nystagmus visible in the upright position, which is unlikely to occur in BPPV patients and which suggests a more serious inner ear disorder. If the Dix Hallpike suggests BPPV, immediately applying the Epley maneuver will result in resolution of dizziness in more than one-half of the patients treated. Continuing Epley maneuvers until all symptoms resolve will increase the resolution rate to more than 90%. If time constraints prevent applying a treatment maneuver immediately, patients can be referred to physical therapy. All patients should be given a home exercise to treat persistent symptoms or recurrences. BPPV is prone to recurrence, which can happen days to years after the first attack. The half somersault maneuver can resolve most recurrences without the need to see a provider. Those whose symptoms fail to resolve will need to be reevaluated with a Dix Hallpike maneuver to confirm the diagnosis of BPPV and additional office maneuvers should be provided. — Carol A. Foster, MD, is an associate professor of otolaryngology at the University of Colorado School of Medicine in Aurora, Colorado. She has specialized in the treatment of dizziness and imbalance for more than 25 years and is the author of a new book on benign paroxysmal positional vertigo, Overcoming Positional Vertigo. Figures reprinted from Foster CA. Overcoming Positional Vertigo. Boulder, CO: Bull Publishing; 2019. 1. Oghalai JS, Manolidis S, Barth JL, Stewart MG, Jenkins HA. Unrecognized benign paroxysmal positional vertigo in elderly patients. Otolaryngol Head Neck Surg. 2000;122(5):630-634. 2. Uneri A, Polat S. Vertigo, dizziness and imbalance in the elderly. J Laryngol Otol. 2008;122(5):466-469. 3. Baloh RW. Vertigo: Five Physician Scientists and the Quest for a Cure. New York: Oxford University Press; 2017. 4. Lanska DJ, Remler B. Benign paroxysmal positioning vertigo: classic descriptions, origins of the provocative positioning technique, and conceptual developments. Neurology. 1997;48(5):1167-1177. 5. Epley JM. Positional vertigo related to semicircular canalithiasis. Otolaryngol Head Neck Surg. 1995;112(1):154-161. 6. Foster CA, Ponnapan A, Zaccaro K, Strong D. A comparison of two home exercises for benign positional vertigo: half somersault versus Epley maneuver. Audiol Neurotol Extra. 2014;2:16-23. 7. Foster CA. Overcoming Positional Vertigo. Boulder, CO: Bull Publishing; 2019.